Kijiji Edmonton keeps serving up gold with this hilarious RV ad that I'm granting instant entry to the Hall of Fame. Remember the movie Spaceballs? Oh, sure you do. It was better than the Star Wars prequels, and featured a Winnebago just like this one. Full of fine Winnebaggery, featuring the wood-grain plasticized veneer you remember from childhood. And you may be surprised to know how many movies and TV shows featured the Winnebago Chieftain. 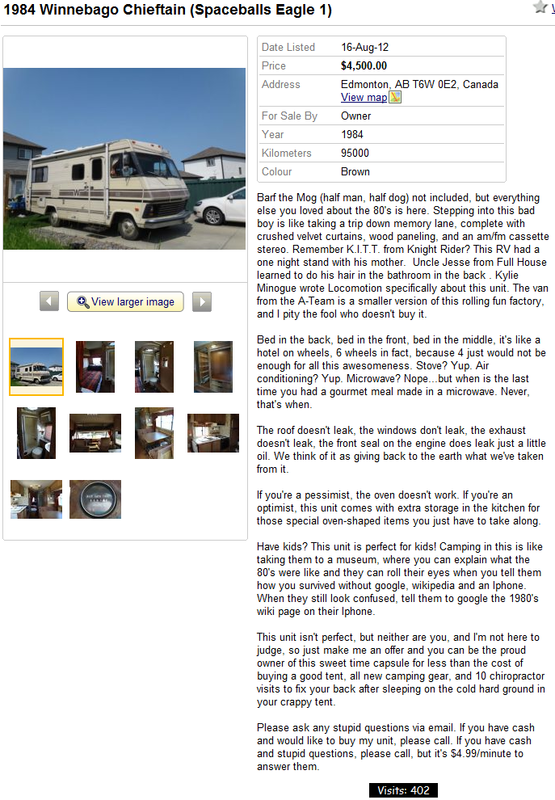 Kick back and savour the wordplay contained in this funny Kijiji ad about an RV from 1984 and its travels through time. Barf the Mog (half man, half dog) not included, but everything else you loved about the 80's is here. Stepping into this bad boy is like taking a trip down memory lane, complete with crushed velvet curtains, wood paneling, and an am/fm cassette stereo. Remember K.I.T.T. from Knight Rider? This RV had a one night stand with his mother. Uncle Jesse from Full House learned to do his hair in the bathroom in the back . Kylie Minogue wrote Locomotion specifically about this unit. The van from the A-Team is a smaller version of this rolling fun factory, and I pity the fool who doesn't buy it. Bed in the back, bed in the front, bed in the middle, it's like a hotel on wheels, 6 wheels in fact, because 4 just would not be enough for all this awesomeness. Stove? Yup. Air conditioning? Yup. Microwave? Nope...but when is the last time you had a gourmet meal made in a microwave. Never, that's when. The roof doesn't leak, the windows don't leak, the exhaust doesn't leak, the front seal on the engine does leak just a little oil. We think of it as giving back to the earth what we've taken from it. If you're a pessimist, the oven doesn't work. If you're an optimist, this unit comes with extra storage in the kitchen for those special oven-shaped items you just have to take along. Have kids? This unit is perfect for kids! Camping in this is like taking them to a museum, where you can explain what the 80's were like and they can roll their eyes when you tell them how you survived without google, wikipedia and an Iphone. When they still look confused, tell them to google the 1980's wiki page on their Iphone. This unit isn't perfect, but neither are you, and I'm not here to judge, so just make me an offer and you can be the proud owner of this sweet time capsule for less than the cost of buying a good tent, all new camping gear, and 10 chiropractor visits to fix your back after sleeping on the cold hard ground in your crappy tent. Please ask any stupid questions via email. If you have cash and would like to buy my unit, please call. If you have cash and stupid questions, please call, but it's $4.99/minute to answer them. This is probably THE coolest ad for anything. Ever. Plus, I'm a huge fan of Spaceballs and the 80's. And what better way to hark my fandom by getting one of these bad boys? I'm sure this one is sold unfortunately, but I'm on the look out. I'm also planning on recreating the interior to mock the Spaceballs Winnebago. Yes, I'm that big of a dork.